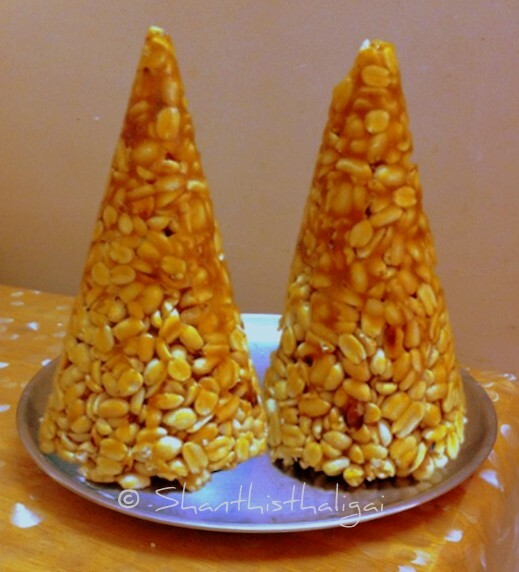 Paruppu thengai is a tambrahm traditional conical pair of sweet, made during all auspicious occasions. When done at home, it is made on auspicious days and kept in Perumal sannidhi before taking it to the function. Paruppu thengai symbolizes the mountain of sweetness. The pairs symbolise a male and a female. So they are MADE ONLY IN PAIRS alongwith small chikki balls which symbolizes children. It is mandatory to make these paruppu thengais for almost all functions like, marriages, upanayanam, gruhapravesham, valaikappu, seemantham, ayush homam(1st birthday), sashtiabdhapoorthi(60th birthday), sadhabishekam(80th birthday) etc. Traditional sweets like peanuts, pottukadalai, manoharam, boondhi ladoo are made with jaggery, and filled in a pair of metal cone moulds to get the cone shape. I do not know why the sweet is named 'paruppu thengai'. Do share if you know.The metal cones are called ‘Paruppu thengai koombu’ or ‘Paruppu thengai koodu’ or ‘Seer koodu’. The koodus will be available in stainless steel marts and metal marts. The chikki like sweets are unmoulded from the cones without breaking the shape, and wrapped with decorative gold papers or gift wrappers and flowers on the top. They are placed on the function stage, near the homam, alongwith other ‘seer’ (gift) items. Customarily, this is made by the girl’s family and given as a seer/gift. Some people keep 5 different varieties of paruppu thengais. After the function is over OR on an auspicious day, these are broken and distributed among relatives and friends. During thirukarthigai festival, small handmade paruppu thengaais are made at home with aval pori, nel pori etc. Nowadays paruppu thengais are beautifully decorated according to one’s creativity, with mirror work etc. Also, they are filled with varieties of sweets like chocolate burfi, cashews, mysore pak. How to make paruppu thengai at home? Making is not tedious, all you need is little patience and metal cones. Making paruppu thengai is like the usual way of making kadalai urundai, pottukadalai urundai or manoharam. The mixture is filled inside the metal cone instead of shaping into balls. The quantity of peanuts vary according to the size of the cones. The paruppu thengais in picture is made with a 9" height cone. NOTE: Make two batches. First fill one mould and repeat the procedure for the other mould. Grease the inside of paruppu thengai koodu with ghee and keep ready. Roast peanuts and remove the skin. Alternatively you can also buy skinless roasted peanuts and dry roast again it until hot. Take a wide plate and put the roasted peanuts in it. Crush jaggery and dissolve in water, strain and make a soft ball consistency syrup. Remove quickly and add it to the peanuts. 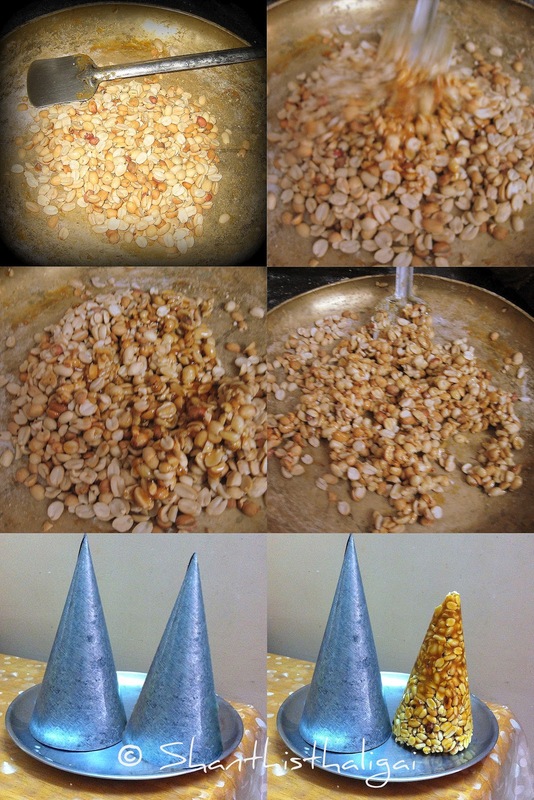 (Tip: Instead of adding the peanuts to the syrup, my grandma and mom always adds syrup over the peanuts and say the jaggery will spread well all over the nuts if doing like this). Mix well until the syrup is coated evenly. Fill the cones with this mixture little by little simultaneously pressing it firmly with a 'keerai mathu' (wooden masher). After filling, dust your hand with little rice flour and press the bottom firmly and evenly with your hand. While the mixture is still warm, grease your hand with ghee and shape some urundais (balls) also. 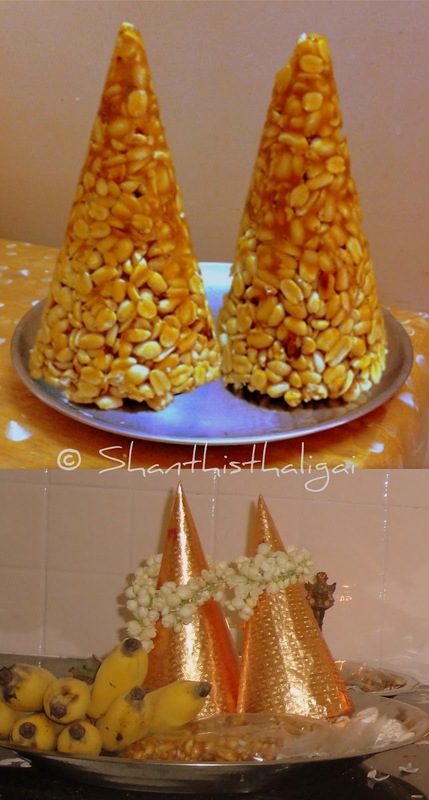 When cool, tap the koodu very gently on all sides and unmould paruppu thengai from the cones without breaking the shape, and wrap with decorative gold papers or gift wrappers with flowers on the top. Home made paruppu thengai is ready. ஆஹா, இது எனக்கு மிகவும் பிடித்த ஐட்டம் ஆகும். உடனடியாக ஒரு ஜோடி ஏர் பார்ஸலில் அனுப்பித்தரவும். எவ்வளவு செலவானாலும் நான் ஏற்றுக் கொள்கிறேன். தித்திப்பான இந்தப் பகிர்வுக்குப் பாராட்டுகள் + நன்றிகள், மேடம்.